One of the most difficult parts of packing is deciding what to bring in your carry-on. What things to pack in a carry-on? What can I bring for liquids? Is it okay to bring snacks? 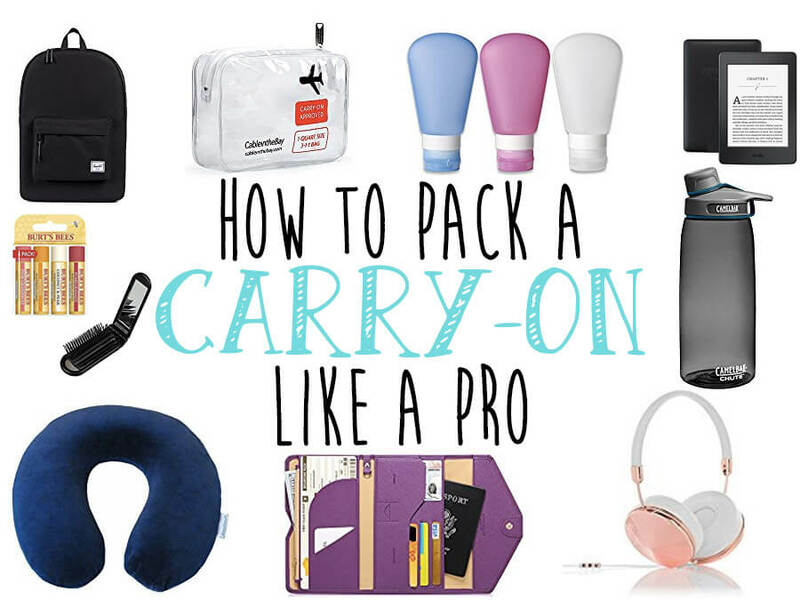 I break down exactly what you need to pack, a few things to consider just in case, some products that you probably wouldn’t have thought to pack and some carry-on tips. This guide is for packing a carry-on that is not for your entire trip. That is a whole other advanced skill that takes longer to master. This guide is strictly for a carry-on that holds the must-have items while everything else goes in your checked luggage. Passport: Don’t think I need to explain this one! Tickets: Have a safe place where you can put these in your bag. Adapter: An adapter is a must for any overseas travel because one of the first things you’re going to need to do is charge your gadgets. Gum: Even if the air pressure change doesn’t bother you it’s always a good to have just in case and is great for when you have a long flight to have something minty for fresh breath after sleeping. Water bottle: I’ve never been on a flight where I got enough water. Bring an empty bottle with you to the airport and fill up after security. Pro tip: Don’t bring one with a straw…I may have sprayed a man with water and soaked myself once in the air after the cabin pressure change when I opened my bottle. Snacks: Have you seen the prices for snacks on planes? It’s a better idea to stock up in the airport beforehand or even cheaper to bring your own. Hang Bag, Backpack or Suitcase: This all depends on the type of traveller that you are. Everything on this list will fit into a backpack or small suitcase and most will fit into a large handbag. Personally I’m a backpack girl, they’re easy to open and fit by your feet. Ziplock or Clear Bag: For any liquids you may have, this seals them just in case they leak and makes it super easy to scoot through security with a TSA approved bag. Pen: How many times have you flown somewhere and then realized you needed a pen to fill in a form before landing? Too many times right? Bring a pen. Grid-It: This is the best way to organize your electronics. Try a Grid-It and you can thank me later. Passport wallet: Keep all of your most important documents safe in one wallet that’s easy for you to grab and stay organized. Phone: A camera for pictures, games, music, everything is on our phones these days so it’s no surprise that you can’t travel without your phone. Laptop/Tablet: I personally work as I travel so a laptop is necessary but this is also be a great option for watching movies or TV shows that you enjoy. Or a tablet works just as well. Kindle: Real books take up too much space in a carry-on so a Kindle is a perfect alternative. Plus you’ll be able to have multiple books with you in case you finish any while on vacation. Camera: It’s always best to bring any electronics you’re travelling with in your carry-on. Many airlines won’t even let you check any electronics. I bring a GoPro because it’s so compact and takes amazing pictures. Chargers: Make sure you have any necessary charges in case you run out of juice. Headphones: Music is one way to drown out loud talkers, annoying children or crying babies. Some prefer small headphones but noise canceling headphones are often the best way to go. Portable charger: I always like to bring a portable charger with me in case I need a charge ASAP or while on the go. A lipstick-sized portable charger is ideal because it’s small and lightweight. Neck pillow: If you haven’t tried a neck pillow yet then you’re missing out. Sweater or cardigan: Planes always seem to be the wrong temperature. You’ll need some type of layer to help you adjust to whatever the temperature is. Scarf: Again, to help you adjust to the plane temperature, so you can be comfy and a scarf can double as a pillow or eye mask. My favourite kind are the circle scarves that have a hidden pocket for any valuables. Sleeping mask: For long flights an eye mask will help darken those small lights that are always on in a plane in case of emergencies and it will block the light from any screens that are on as people watch entertainment around you. Earplugs: Drown out any noise while you sleep, earplugs are an awesome way to go if you can’t sleep to music or get irritated from headphones being in your ears for too long. Compression or warm socks: Your feet can swell a lot, especially during a long flight. Compression socks will help the swelling. Warm socks are just nice to have for any flight length so you can be extra cozy. Toothbrush + toothpaste: There are few things that feel as good as brushing your teeth after sleeping on a plane. And don’t forget to get a case for your toothbrush! Hand sanitizer: Germs are everyone on planes and in airports. Hand sanitizer is a must before you eat. Melatonin: Melatonin is a natural sleeping aid that helps keep you asleep. Hairbrush: Because let’s face it, you are not sleeping beauty and won’t wake up with perfect hair. I love to use a dual functioning mini hairbrush with a mirror. Moisturizer: Becuase we all know plane air can dry out our skin like crazy. At least have a mini hand moisturizer on you! Lip balm: For the same reason as above. Hair elastics/Bobby pins: If you’re like me your hair is going to annoy you at some point on your flight or you’ll get too hot and just need your hair off your neck. Makeup: I’m not a makeup person but I always carry some type of concealer or foundation for small touch-ups on blemishes. Mini cosmetic bag: A mini cosmetic bag to hold all of your mini toiletries and to help keep you organized. Medication: If you have any medication that you need daily or will be affected if it freezes in your checked luggage then bring it in your carry-on. There’s no best way to pack a carry-on bag as that will change from person to person depending on what you need to access the most. My top tip is to make sure you have a bag that has outside pockets that can hold the smaller items for easy access such as headphones, an eye mask, ear plugs, hand sanitizer and lip balm. In the larger section of your bag lay any of your flat items in first such as a laptop/tablet and Grid-It. I also like to keep my Grid-It inside of a plastic bag that I put my Kindle in the back of so I always know where it is. Put anything you won’t need access to at the bottom such as sunglasses or a spare set of clothes. Roll any clothing you have that you’re not wearing and then place the smaller items that you’ll need the most on top such as your snacks, water bottle, compression socks, melatonin and scarf. And viola! 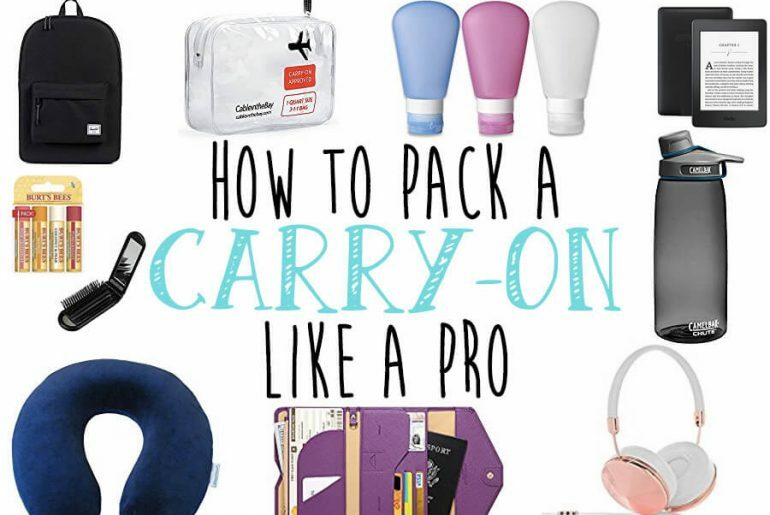 What Can You Pack in a Carry-On? Now you’ve got the tips for how to pack carry-on luggage and have the knowledge for how to pack the smart way. You won’t ever forget anything or pack too much again.